Hi Fellas! Hope you are getting along with life pretty well. I am back to give you a daily dose of useful information. Today, I’ll unlock the details on the Introduction to CR1220. It is known as a lithium coin battery that comes with a high voltage around 3V and encompasses an ultra-compact design, helping you gid rid of the hassle of buying two or three extra traditional batteries, saving both cost and space required to adjust these cells in the relevant devices. 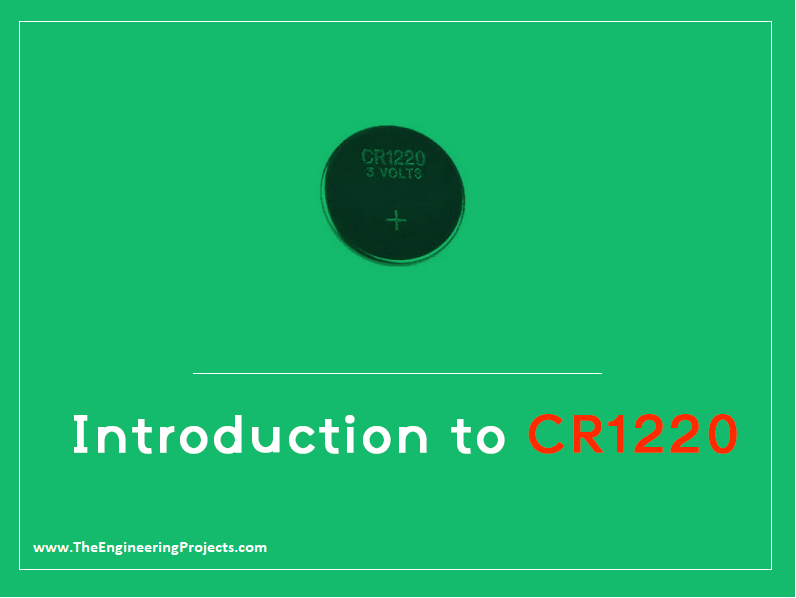 In this post, I’ll try to cover each and everything related to CR1220, breaking down its details in simple steps you can get a hold what is this about and how it is used for. Let’s dive in and explore everything you need to know about this battery. 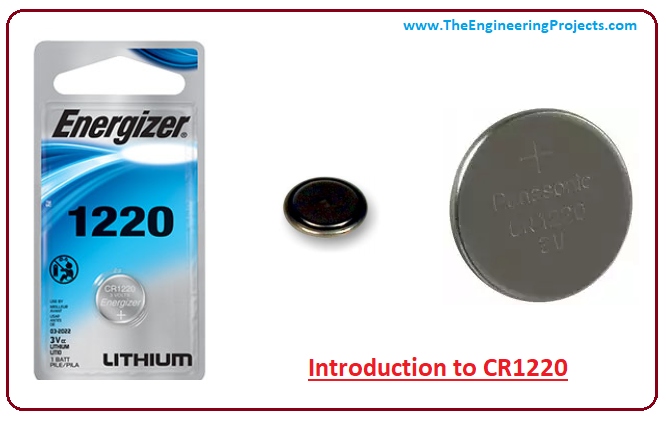 CR1220 is a button cell, also known as lithium coin battery, that is mainly used in high power devices such as keyless entry devices, glucose monitors, heart-rate monitors, and toys & games. It comes in cylindrical shape and can retain power for a maximum period of time. If it is spared alone for one year, it will discharge only 1% of the total battery capacity. This battery is slightly different from CR2032 in terms of battery capacity, weight and lithium content as former comes with 35mAh capacity with 0.8g weight and 0.006 grams lithium content while later contains 285mAh capacity, 3gram weight, and 0.109gram lithium content. It features small and compact shape, making it an ideal choice for hard to reach places. Prior precautions are required to keep this device safe and away from the kids. If swallowed, this device can cause a severe health damage or death in some cases due to the chemical composition it incorporates. The output voltage it can deliver is around 3V, enough to drive some small devices like wristwatches and glucose monitors. Both positive and negative electrodes are stainless steel SUS430 and Nickel plated. It is important to note that, no coatings or other foreign objects are required on the surface of terminals that can severely affect the real use or performance of this coin cell. Battery compartments work best to encapsulate this battery, making it safe and away from the kids. They can be designed using two methods: an extra mechanical tool like a screwdriver is required to unlock the battery compartment or you can apply two independent movements of the securing mechanism by a single hand. These battery compartments come with an ability to retain different cells where capacities will vary by size. Features of any device can help you better understand major functions associated with it, helping you make a final decision before picking the device for your relevant project. Following are the main features of CR1220. Some cells are made from different chemical compositions, making them mechanically interchangeable which may directly service life voltage stability of the cell. 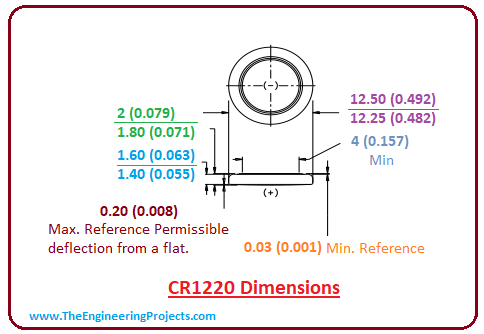 Following figure shows the dimensions of CR1220. The dimensions are given in mm vs inches. Pay special heed while selecting the coin cell for a required device, the wrong pick can intensively affect the device performance, resulting in a sheer hindrance in the operating process. CR1220 comes with a wide range of applications that require temporary power on the fly. Following are some major applications of this coin cell. That’s all for today. I hope you have found this read useful. If you are feeling skeptical or have any question you can approach me in the comment section below. I’d love to help you according to the best of my expertise. Feel free to keep us updated with your valuable feedback and suggestion, so we keep providing quality work and you keep visiting us for what we have to offer. Thanks for reading the article. PreviousPrevious post:Final Year Project: The Ultimate Guide for BeginnersNextNext post:How to use analogWrite in Arduino?